For those of you that haven't yet got Pro Media Tools or might not have heard what it is - well it's is a suite of workflow tools from Digital Rebellion that simplifies media management and workflow bottlenecks that many of us encounter on a daily basis. With incredibly useful tools for detecting gamma shifts, editing QuickTime movie metadata, watching render files, editing markers and batch renaming to name but a few. The applications are capable of outputting a variety of file formats to suit different editing systems and workflows, and can even convert one data format to another, such as importing Avid locators into a Final Cut Pro project. Most of the Apps support Final Cut Studio, Final Cut Pro X, Avid Media Composer and Adobe Premiere CS5 for Mac. The key updates to the basic suite are full 64bit support and with overhauls to many of the apps you will notice much improved processing times. 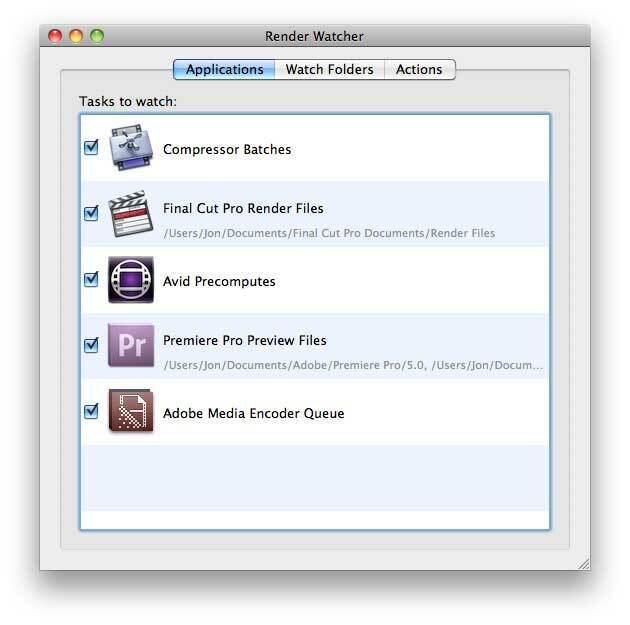 Render Watcher can now watch Adobe Media Encoder and Compressor 4. An exciting inclusion is the addition of Post Haste a template based asset management tool designed to make life simpler by automatically creating your project directory structure so you don't have to do it manually and you can set up filename parameters such as project name, client and date to create a common naming convention for instance in a shared environment. With Post Haste the suite becomes even more great value. Jon at Digital Rebellion also informs me that there is a fully functional 15-day trial available that does not have any limitations, so it's a great way to try before buying. This is an invaluable tool for DITs or anyone wishing to perform integrity checks on copied media and can copy and verify any removable volume connected to your computer. You can set it to Auto Mode and upon inserting your Camera media you can have Auto Transfer automatically copy it to your computer. Auto Mode works for P2, RED, AVCHD, XDCAM, Canon EOS and ARRI Alexa but any type of volume can be transferred manually. The most valuable function for me is the ability to copy to multiple destinations at once and verify the copied data to ensure it is as pristine as the original. Something that does not happen when using the Mac OS finder to copy files. If you use a tapeless work-flow this App is an absolute must and is well worth the full suite price just to have this. It will save you time and stress. I used Auto Transfer extensively on the last Feature Film I worked on - it took the pain out of manually comparing copied files as Auto Transfer does a Checksum and warns you if there are any differences from the original in the copied files. This enabled my DIT team to manage full transfers, backups, archive copy and get on with Proxy generation without working late into the night. Highly recommended for self-shooters and camera department alike. This app I have say is one of the most useful in terms of the amount I use it. Although targeted at AV media it is brilliant for renaming large sequences of files for web or just general house-keeping. You can rename multiple files in one action with option to find and replace, frame renumber, pad frames, offset frame numbers, add a prefix or suffix, change the file extension and more. 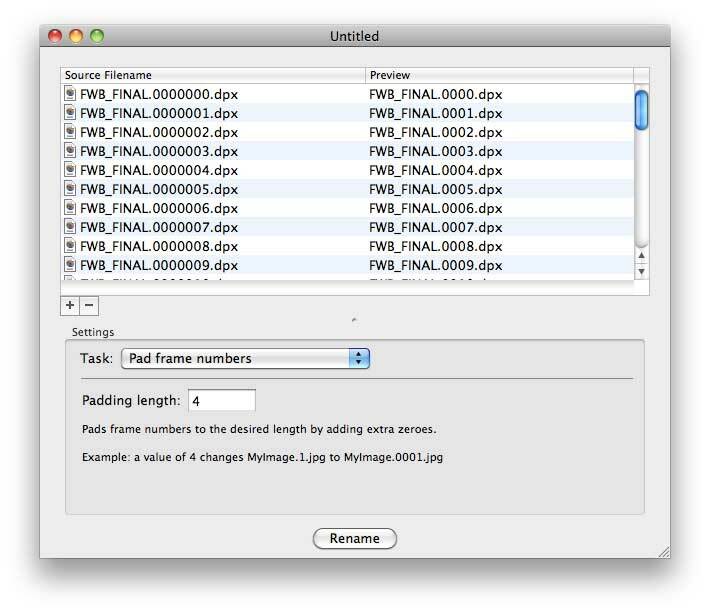 What makes Batch Renamer different from other renaming apps is that it's designed for use in film and TV so there are lots of options for managing frames such as finding frame gaps, incrementing numbers, reversing, reordering, etc. 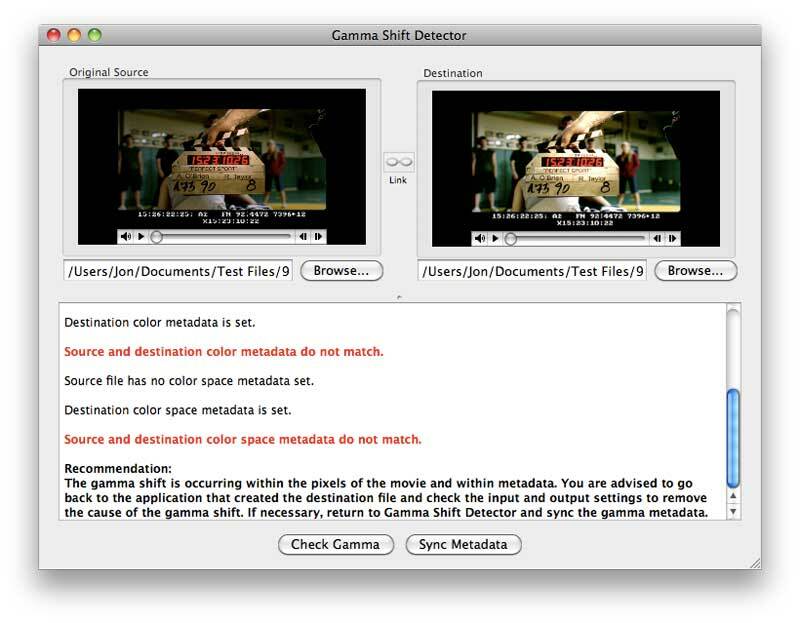 Edit Detector - detects edits in Quicktime movies...Err and thats it. But actually its massively useful if you ever want to generate a marker or cut list of a movie file. You can set the sensitivity and export an FCP marker list, CMX3600 EDL (Remember those? ), Avid ALE or xml, txt and csv amongst others. This can be useful for cutting up raw footage into individual shots. Just scan it, make adjustments as necessary and then export as markers in an FCP XML file. 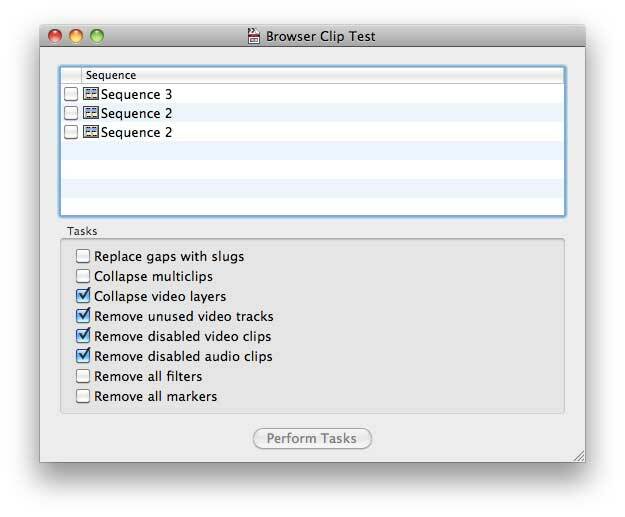 You can then turn the markers into subclips within FCP. Gamma Shift Detector is great tool for those working across multiple codecs and ProApps. Using Digital Rebellion's Gamma Shift Detector means you can test for even a subtle shift in the Video Gamma or if it's metadata is set wrong. You can check that FX work is output correctly from Adobe After Effects, Motion or another App and that it matches the original project. By testing the the source and destination media you generate details that are useful to fixing the workflow, enabling you to shift the gamma, or set it correctly in the App that created it or replacing the metadata with the correct information from the source. Or if you know what you are doing you could load the destination file into another of the suite's apps - QT Edit - and correct the Metadata mismatch. Project Overview gives you a complete breakdown of your Final Cut Pro project with a rundown of all the media associated with it, their locations (at least where they are supposed to be), the files sizes and it also allows you view and batch edit all media, effects and markers. By using the search field to filter the results, you can easily disable all Color Corrector 3-Way effects without affecting any other effects, for example. 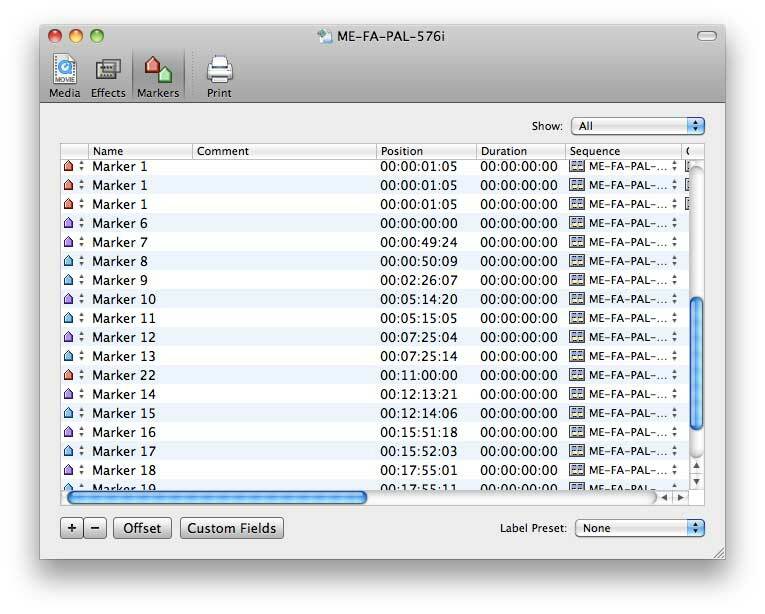 You can also import and export Avid Media Composer and Final Cut Pro marker lists. Currently Project Overview doesn't support Avid Media Composer or Final Cut Pro X projects. 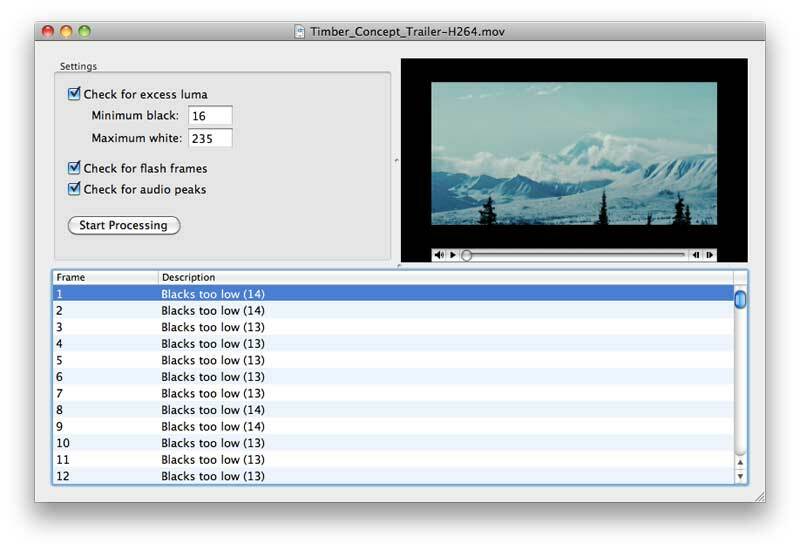 As the name suggests it allows you to edit certain elements of QuickTime movies. 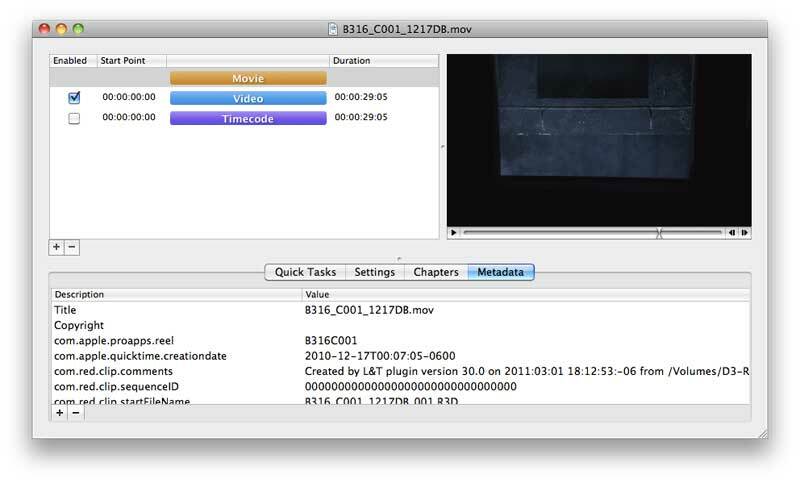 You can add and remove media, add, edit or remove timecode tracks, change chapters markers, alter or correct metadata, and adjust the Quicktime Attributes similar to opening in QT Pro and editing it's properties. Any alterations you make are displayed in real-time in the preview window. Quick Tasks can be performed from a drop-down such as removing empty tracks or setting the correct pixel aspect ratio for anamorphic footage that may have be wrongly flagged upon digitizing. You can even add Quicktime Text tracks to movies. However for me it's the replacement for one particular function that Cinema Tools performed; that being conforming a movie from one frame-rate to to another. If like me you produce NTSC versions of PAL movies via 25p to 24p frame-for-frame conversion or if your have true 30p media from DSLR and need it at 29.97 then this little app will do the job - it even gives you the option of removing and replacing the TC track to reflect the new Timebase. You can conform to any frame-rate you desire simply by typing it in to the frame rate box or choose a commonly used rate from the drop-down. Normally you would have to open in Cinema Tools (no longer available) and then conform to your desired rate and then open in QT Pro and remove the old TC track (as it would still reflect the old Timebase if opened in FCP et al). Then save that file before you can use it. Apart from being available - its just quicker to do in one app plus you can create a new TC track that reflects the new Timebase. Please be aware that you should only edit certain parts of your Quicktime movies if you know what you are doing as you can quite easily screw them up. However you can save a copy or use a duplicate of your original file so you'd have to be pretty dumb to mess it up! But I feel it's worth warning everyone anyway! QT Edit can import chapters from other QuickTime movies, Final Cut Pro marker lists, Avid locator lists and Final Cut Pro X XML files. FCPX does not currently include your timeline markers when exporting a QuickTime movie so QT Edit is an easy way of adding them. Quick Bins is an app for those with a serious need of a house-keeper for their unruly media files. 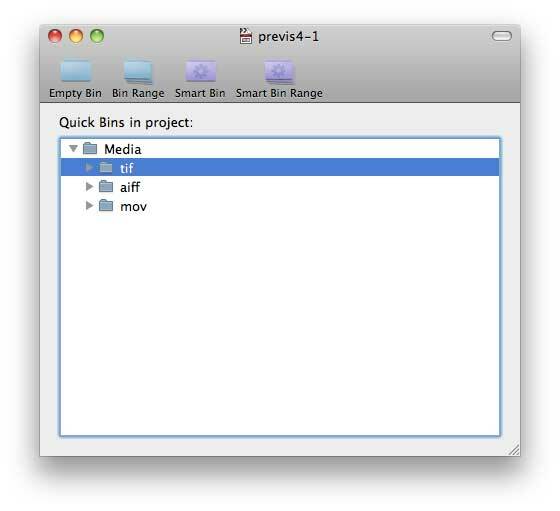 With it you can create a set of bins in your FCP browser or organize media into bins via "smart bins" in your FCP projects. You can set smart bins by any/all of 22 different options including clip name, filename, codec, reel or even file path. Very useful for quickly sorting an untidy mass of dailies. Currently Quick Bins is not supported by Avid Media Composer or Final Cut Pro X which has a very different way of media management anyway. If you haven't caught on yet Digital Rebellion has a naming convention that basically says what it does on the tin… and Render Watcher is no less obvious - it watches your render files from FCP7 (or earlier), Avid Media Composer or your Apple Compressor batches and gives you an audible notification, or if you have it installed, a text notification via "Growl" when renders or exports are complete. If you download an app called Prowl or Boxcar, you can receive Render Watcher alerts as push notifications to your iPhone or iPad providing that you have Growl installed on your Mac. But thats not all - a really cool function for all those who like to go out for lunch whilst the timeline renders or your exports, er, export, is the ability to send an email or SMS text message to whomever you wish to be alerted that its all done and ready for the viewing. 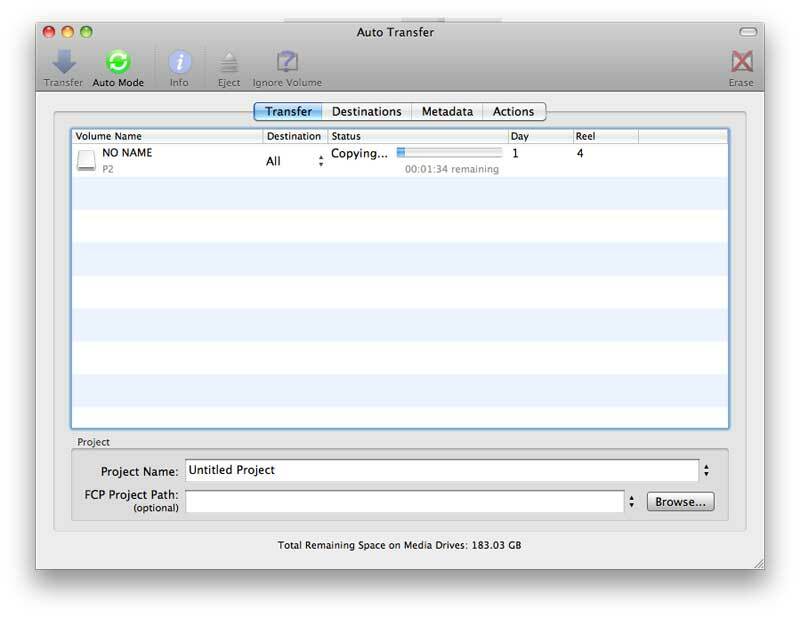 You can show the file in Finder or open the completed file in QuickTime Player or you can send the completed file to another application such as Compressor for further processing. You can even can even set your Mac to sleep, log-out or shut down when all renders are finished! Great in a time when electric power costs are rising and often HD, 2K and 4K renders are done overnight. Growl is free for Mac OS X 10.6 Snow Leopard (or earlier) but is a paid app for Mac OS X 10.7 Lion (currently $1.99). For more information visit: http://growl.info/ (Digital Rebellion is not affiliated with Growl). PS. whilst writing this review my Render Watcher dinged at me! LOL love the timing. Currently Timeline Tricks is not supported by Avid Media Composer and is compatible with FCPX but is limited to removing markers and filters only. 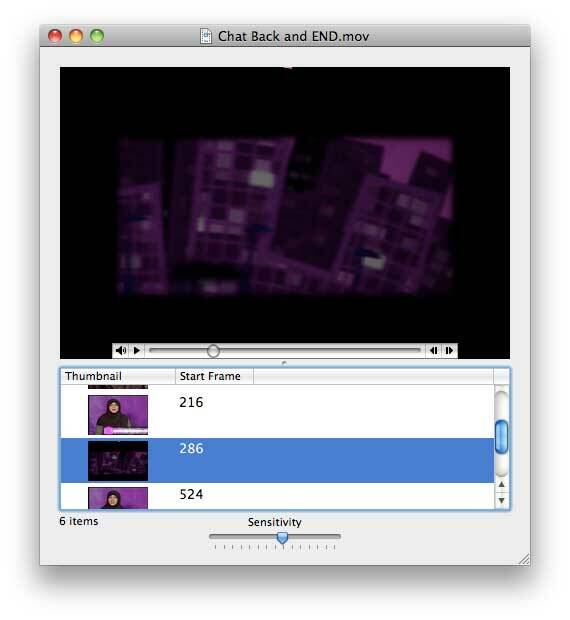 Video Check is your personal video scanner providing checks for illegal luminance values, flash frames and audio peaks, it then shows you the frame(s) where they occur so you can exact a remedy before you fail that tech check! It can output the results to an FCP marker list, Avid locators, CSV and text. 10-bit codec support for Video Check is offered only for Lion users, so Lion is the recommended OS for Video Check. OS X 10.5 and 10.6 users are limited to 8-bit. I use Lion exclusively now on all my systems with no issues in FCP7, FCPX or Premiere and will be running Avid MC 6 as soon as the clients request it or they send me a copy ;) so there is no excuse for anyone to stay in the past! Even if you only use a few of these apps then you will undoubtably save the cost of the license in time savings in a very short while. They provide many of the missing features that we have all been clambering for on the feature wish lists of our chosen NLE - well now there is a solution. One caveat for Adobe Premiere Users is that Project Overview, Quick Bins and Timeline Tricks support is via Final Cut Pro XML. You need to convert to FCP XML, pass it through the app and then reimport the XML file. This may change in future versions. For more information on Pro Media Tools visit Digital Rebellion's website. By day Ben King is a mild mannered Designer, Director and Editor based in the UK. By night he is one of our LAFCPUG Moderators. In his 18 years of industry experience Ben has accumulated a crazy amount of knowledge in all areas of the media. He has a few feature film credits to his name (all cut on FCP) but he also does a lot of work for Television and is currently Senior Editor on a new Primetime BBC one series that has the working title "The cost of living".